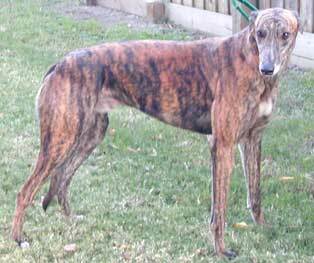 Chewy, aka Wigs Rose Pine, born September 10, 1998, is a three-year-old red brindle. 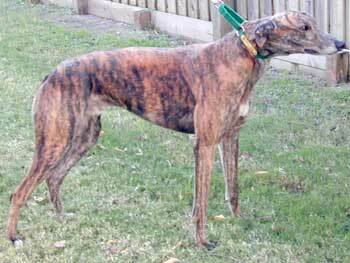 Chewy raced at Wheeling Downs, West Virginia, his whole career as a top grade A competitor. He suffered a broken right front leg which lead to his early retirement. He's all mended up now and ready for his second career - Retirement! Chewy is affectionate, sweet and very friendly and he is Arrow's brother.